John Ruskin was an author, art critic, philosopher, and advocate of social reform. He was born in 1819 at London, the only child of wealthy parents (his father was a sherry merchant.) Thus he enjoyed the privileges of private tutoring, an Oxford University education (where he won a poetry prize), and extensive travel in Europe. He graduated from Oxford in 1846 and, in 1848, married Effie Gray. However, in 1854, his marriage was annulled on the grounds of non-consummation. Ruskin taught at the Working Men's College in London in 1854. In 1869 became the Slade Professor of Art at Oxford. Ruskin first visited the Lake District in 1824 (he attended Crosswaithe Church) but did not move there until 1871 when he bought the 250 acre estate, Brantwood, on Coniston Water's eastern shore. At the time it cost £1500 and was purchased site unseen. He lived at Brantwood from 1872 until he died in 1900. The house was a cottage when purchased, but he further enlarged it, adding a turreted bedroom, dining room, studio, stables, coach house and servants' quarters. The substantial estate was further enhanced with gardens and landscaping. Brantwood contains Ruskin's furniture, a collection of paintings, books, and other personal possessions including his own artwork. A film about his life is part of a visit to the home. 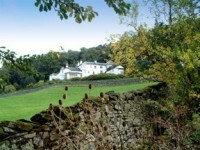 Many famous artistic and literary figures visited Ruskin at Brantwood. Rossetti was a close friend, as was William Holmer Hunt, one of the founders of the Pre-Raphaelite movement. Leo Tolstoy was enamoured of Ruskin's social ideas and called him “one of the most remarkable of men”. Ruskin wrote on human rights and influenced others with his thinking. At the same time many were offended by his views. Ruskin published 134 manuscripts, including a large number of books among which were Modern Painters (five volumes), The Seven Lamps of Architecture, Stones of Venice, and the Art of England. Towards the end of his life he wrote his autobiography, Praeterita. His works influenced the Victorian Gothic Revival in architecture and the Arts and Crafts movement's philosophy of valuing works by master craftsmen. At Kirkby Lonsdale is a view from the churchyard over the River Lune Valley and the medieval Devil's Bridge. It is known as Ruskin's View because of a comment Ruskin made after seeing J. M. Turner's painting of the scene. He said, “The Valley of the Lune at Kirkby Lonsdale is one of the loveliest scenes in England...” Another favourite view of Ruskin's is Friar's Crag (first visited at the age of 5) at Derwent Water's head, just south of Keswick. He thought it one of the top views in Europe. 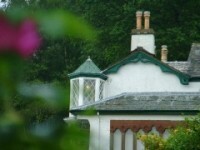 In Coniston is the Ruskin Museum established by Canon Rawnsley in 1901 as a commemoration of Ruskin's life. It contains a collection of his paintings and prints, a chronology of his life, and other Ruskin memorabilia. Included is his collection of minerals. 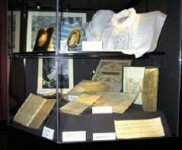 Other documents and information on Ruskin are held at the Ambleside Museum-Armitt Library, Lancaster University, and the Sheffield Ruskin Gallery. Ruskin suffered his first of many bouts of mental illness in 1878 and lived as a recluse from the 1880s until his death. A green slate carved cross (designed by Ruskin's friend and secretary, the water-colourist W. G. Collingwood) marks Ruskin's grave in St Andrew's churchyard in Coniston. Brantwood is reached by road, by the National Trust Steam Gondola, or by hiking from the village of Coniston. Open daily 11-5:30, except Christmas and New Year's. House, Gardens, Craft Gallery, Exhibitions, Restaurant.